Sober Look: An Offshore Swan: Could the next financial crisis be sparked by China being pulled into the Currency War? An Offshore Swan: Could the next financial crisis be sparked by China being pulled into the Currency War? For nearly a decade, China’s maturation from a major exporter into a global economic dynamo has occurred with the embedded assumption that CNY will continually strengthen. This made sense given the backdrop of a currency that has been held well below a market driven rate by the peg to the USD and then managed float. China’s Yuan policy also included strict foreign capital controls that significantly limited outside investors’ avenues to partake in this compelling carry-trade. China has begun to liberalize its financial system and Yuan policy. One major step was greatly relaxing restrictions on the Hong Kong based offshore Yuan (CNH). While this currency is somewhat tethered to the onshore Chinese Yuan (CNY), it is at the end of the day a market driven currency. The CNH became the funnel for foreign money to participate in the carry and for onshore entities to borrow in foreign currency. As the PBOC pursues internationalization of the CNY, the currency has been freed to appreciate in increasingly looser trading bands, currently 2% from the fix. This has occurred while the Chinese economy attempts to pivot from largely being export and investment driven to more consumption and services driven. Currently China’s export sector is under significant pressure from some of its largest trading partners via the BOJ and ECB’s forward balance sheet expansion, driving down their currencies. Exacerbating this move is the FED ending QE and speaking to further policy normalization putting upward pressure on the USD and by extension CNY. The stresses from exchange rates are likely not in synch with the PBOC’s timeframes for allowing services and consumerism to fill the gap left by exports. This puts direct pressure on China’s exports during a time when aggregate demand out of EU is weak and Japan is very shaky. That said, China’s pivot in trade and economic ties is directed at AXJ (Asia ex-Japan). The PBOC has gone to great lengths to provide funding facilities to the overextended and cycling down credit markets while avoiding a wholesale policy cut (benchmark rates and required reserve ratio). The latest iteration, the Medium-Term Lending Facility, provided 3-month liquidity at 350bps to the tune of 769.5B Yuan in Sept and Oct. The heavily levered Chinese corporates (w/ debt-GDP levels of 124%, as noted by BAML) have increasingly turned to USD bond issues. A continued deterioration in credit markets would warrant a move on benchmark rates and required reserves. As this possibility grows it is likely to be reflected by higher vols. Given the long running, strong performance of the CNY and CNH carry trades over the past few years and the rapid growth in the offshore currency market, it is reasonable to expect net exposure is large and leveraged with investors and financial institutions. Furthermore, the size of cross border trade with China has led RMB to be the 2nd largest trade finance currency. This leads me to believe that foreign corporates may have large exposure to the carry via RMB trade finance arrangements and is evidenced by over-invoicing. Furthermore, this could be resulting in a favorable and potentially fleeting skew to the underlying economics of trade with China. Anecdotally, having spoken with a businessman who imports from China, I sensed more excitement about his exposure to the currency than the underlying business. 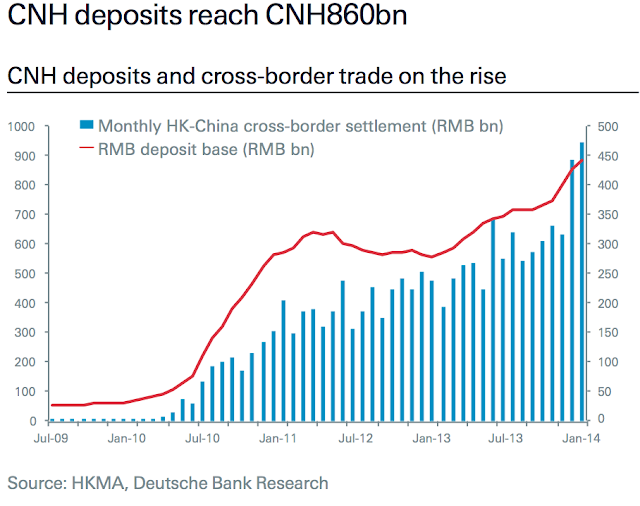 As described above, a confluence of events and circumstances exist that cause me to be wary of the engrained (but increasingly questioned) assumption of a one-way path (and trade) for the Chinese currency. In fact, I would put a far better than 50/50 chance that the CNY and CNH will experience a period of unprecedented depreciation and volatility over the next 12 months. Future volatility will likely exceed the bout of volatility experienced in 1Q2014 brought on by the PBOC to shake out one-sided bets. The implications would be hugely disruptive to global markets. Implied vol rerated higher with the PBOC doubling of the USDCNY trading band to 2% on March 17, 2014. An external market shock- This could be broad market volatility brought on by the FED’s positioning away from ZIRP that will have spillover on the EME’s and carry trades. Market volatility (risk-off environment) could also come in the form of credit market contagion stemming from the energy space (which makes up ~18% of N.A. HY). PBOC broad based monetary policy loosening (this includes changes to FX trading bands, new cheap money lending programs and aggressive use of their balance sheet)- This can come in response to; (a) further credit market deterioration; (b) weak economic and inflation prints; and (c) pressures exerted by the current round of currency devaluation by other central banks.